Arenal or Monteverde? Which is better? Planning a trip to Costa Rica is a bit of a challenge considering how much there is to do, not in just one area, but in every region of the country. Many visitors opt for in-land adventure activities followed by time for relaxation on the beach. While considering where to go in-land, you will invariable come across Arenal/La Fortuna and Monteverde as being top destinations for a classic Costa Rican adventure. Given the unique appeal of both destinations, it’s no wonder that for visitors with limited time, the question quickly arises – which is better? Should I go to both or just one? I had this question over and over while planning our trip, so I decided to do both just to check them out. I cannot say which is better as that almost always amounts to personal preference, but I can provide details on what both places have to offer so that you can make the most informed decision possible. When considering the logistics of getting to/from the airport to either of Arenal/La Fortuna or Arenal, there is almost no difference. Regardless of which airport you fly into, San Jose or Liberia, it will take you approximately the same time (3-4 hours) to get to both destinations. There are similar transport options available from both airports as well and the cost of a private hire car service is about the same. OK, so that takes logistics off the table! One town has a looming volcano (Arenal) dominating the landscape while the other is often covered in clouds. The two towns have quite a distinct feel about them. Both Arenal and Monteverde, however provide a good variety of necessities required by travelers – ATMs, grocery stores, shopping and a variety of places to eat. Arenal/La Fortuna provides a bit more of a urban feel, although depending on where your hotel is located, you may feel it is more rural as several great hotels are tucked deep into nature. The center of town feels larger than Monteverde and overall the two areas where tourists stay in Arenal and La Fortuna feels much more spread out than in Monteverde. The beauty of Monteverde is it’s hills. Even with the hills, however, Monteverde feels very walkable. We were able to walk from one end of town to the other quite easily (if you ignore the huffing and puffing going on!). The town feels small and welcoming with mostly just a small selection of the basics available. The weather in Arenal/La Fortuna and Monteverde couldn’t be more different. This is a positive for me, but for some travelers it is a real turn off. Arenal/La Fortuna tends to be quite sunny and warm much of the year. During the rainy season, it remains warm with occasional rain showers. As you pass over the mountains to Monteverde, you will begin to feel the difference. Due to it’s higher elevation, the temperatures tend to be much lower (averaging around 65-75 degrees), with more cloud cover and is much windier than Arenal/La Fortuna. Monteverde also receives much more rain during the wet season than Arenal, making it a little less enjoyable for many. Even during the dry season, it is recommended to have your rain jacket handy at all times! If accommodation options are a big deal to you, Arenal/La Fortuna would be a better bet as it has a much larger range of accommodation options at a variety of prices. From top end resorts like Tabacon Hot Springs to a farm homestay and backpacker guesthouses, you are sure to find something to fit your needs economically and aesthetically. Even with an abundance of accommodation options, hotels fill up quickly during peak seasons, so book early for the best choice. In Monteverde, the options are much slimmer, however still providing a good range of options. Monteverde is not the place to go if you want luxurious accommodation as most of it’s offerings lean more towards small family-run lodges and cabins with a slightly more rustic feel. There are beautiful properties for sure, but their level of luxury is not to the same standards to what is available in La Fortuna. If you want to stay more immersed in nature, you can find this a bit more easily in Arenal where several hotels have made their base on expansive properties tucked away off dirt roads. Most accommodation options in Monteverde tend to be off the main road providing less of a nature escape even though it is considered to be more of a nature hub. As far as activities go, both towns have very similar offerings. In both Arenal/La Fortuna and Monteverde you can walk on hanging bridges, go zip lining, see animals on a night tour and go hiking. However, the differences arise when it comes to where you will be doing these activities. Monteverde is a cloud forest while Arenal is mostly secondary forest with a looming volcano producing a lava rich landscape. Arenal is often nicknamed the epicenter of adventure for the abundance of activities present. There are numerous opportunities for hiking, horseback riding, mountain biking, water sports (rafting and more) and zip lining to name a few. Monteverde on the other hand is more geared towards a particular type of traveler – one who loves nature. Those who cannot get enough of nature’s sights and sounds will fall in love with Monteverde. The area is home to a great deal of Costa Rica’s protected land and offers a number of preserves (including the Monteverde, Santa Elena, and Children’s Eternal Rainforest reserves) to explore. While visitors can go on hanging bridges, zip lining and horseback riding, much of the area’s offerings tend to be more geared towards nature hikes immersing oneself in the unique flora and fauna of the area. One activity quite popular in Monteverde that we did not come across in Arenal is a plantation visit (coffee, chocolate, sugar cane, cheese). This is a big hit on many pre-packaged tours, however independent travelers can easily hop on a tour at the last minute through offices in town. Wildlife is for our family one of the most important aspects to consider between the two destinations. In both Arenal and Monteverde, there are an abundance of animal sightings to be had. There are things we saw in place that we didn’t see in the other, but overall both destinations offered a good deal of opportunity to see animals in the wild. Sloths are located in both places as well as spider and howler monkeys. There are a variety of small animals (snakes, insects, spiders, etc) in both destinations as well. For birders, Monteverde offers the chance to see the beautiful quetzal. However, venturing around at Arenal Volcano, you will also see plenty of toucans, macaws and more. If you can only visit one destination, don’t worry, you will see most animals in both locations. Some of Costa Rica’s most loved activities and most breathtaking landscape are located in these in-land areas, making a stop imperative. While we loved our time in both Arenal/La Fortuna and Monteverde, they are similar enough in some ways that for a quick visit to Costa Rica you can choose just one destination to visit. If you are short on time, determine what is most important to your family. If it is adventure activities, Arenal wins with a greater diversity in things to do from hiking to hot spring hopping, as well as offering endless opportunities for day trips. However, for nature lovers, Monteverde feels like a more manageable town that is easily walkable (albeit up some big hills sometimes!) with a greater focus on being able to fully immerse yourself in nature with an abundance of nature walks through well protected reserves. Either way, you will probably just have to face the fact that you will fall in love with Costa Rica and be back again many more times as there is so much more to explore. For more ideas on where to go on your trip, check out popular destinations accessible from Liberia Airport. Have you been to either Arenal/La Fortuna or Monteverde? What’s your verdict? Or share this post with others by pinning on Pinterest! Thank you. I thought I was the only one with this dilemma. 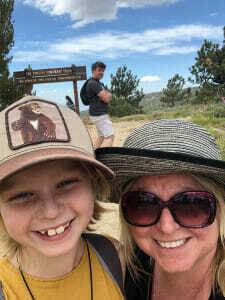 A travel obsessed mom and a nature obsessed son exploring at home in Southern California as well as throughout the world looking for adventure, nature and a little luxury too! A true international family - a Texan bred Mom, Irish bred Dad and a son born in India - exploring the world one trip at a time. We aim to inspire families to explore where and when they can even if it's in their own city!